A beautifully developed website doesn’t matter if no one ever sees it. 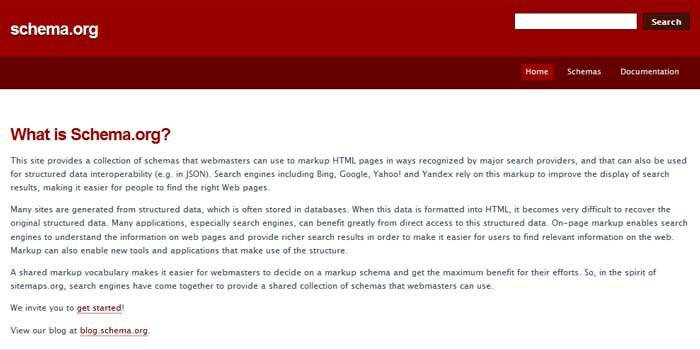 Incorporating structured data markup, according to standards from the Schema.org project, makes it easier for search engines to crawl your site. Although there’s no hard evidence that structured data markup directly improves search rankings, it can increase the number of referrals from search engines to your site, and it can help your search rankings by working hand-in-hand with Knowledge Graph. Structured data markup makes your site eligible for inclusion in voice search, maps, and experiences like Google Now. It also enables Google to promote your events, and Google is piloting a feature that would allow searchers to play music, watch videos, and read critic reviews within search results. Structured data markup also promotes your content in two important ways: by creating rich snippets and customizing your Knowledge Graph information. This rich snippet from NBC.com has the usual title and meta description, and thanks to structured data markup, you can also see a video preview. In this rich snippet from Barnes & Noble, you can see not only the title and a description (admittedly, the meta pulled from the product description isn’t highly effective) but also star ratings, price information, and available formats thanks to structure data markup. 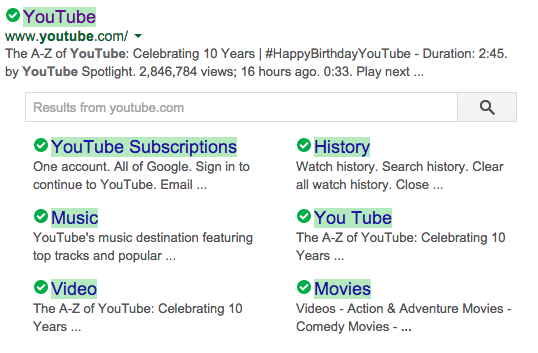 This YouTube rich snippet includes a sitelinks search box. Instead of navigating to YouTube and then searching for their favorite cat video, users can search for it within the rankings. You can also add breadcrumbs to your rich snippets, which show users the hierarchy of your site. For example, breadcrumbs for a men’s clothing retailer might look like Home > Men’s Clothing > Pants > Kenneth Cole. Google’s Knowledge Graph is a tool that helps Google learn to answer searchers’ questions better. It combines data about different people, places, and subjects from many disparate resources. With structured data markup, you explain yourself, your business, your cause, or your event to Google. When people query Google about something related to your site, your site will come up more often. You also have a shot at getting information about yourself displayed prominently in Google’s right sidebar. 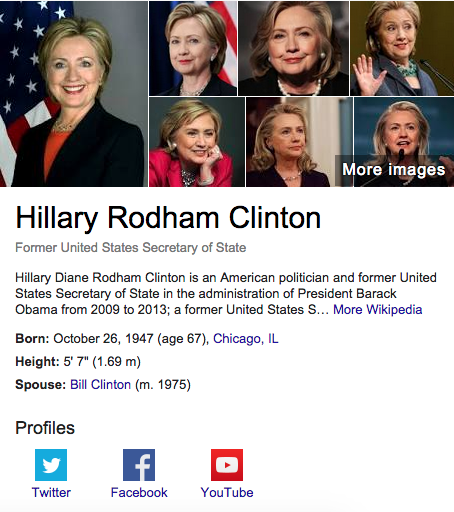 Thanks to structured data markup (and most likely, an existing Google+ page), Google can display a biographical snapshot of Hillary Clinton on the top right of the search page whenever someone searches for her. Her social profiles are also customized thanks to structured data markup. Knowledge Graph customization works both for people and businesses. Businesses, for example, can add structured data markup to their websites that will cause Google to display a logo and a business telephone number within its search results. 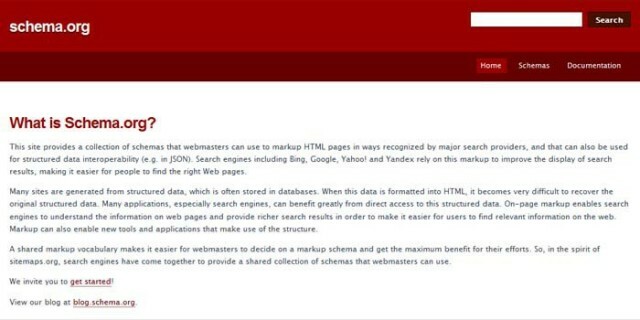 Schema.org is a collaborative effort between Bing, Google, Yahoo, and Yandex designed to standardize structured data markup for the major search engines. It’s a series of tags, or micro data, that you add to your site’s HTML. You can visit schema.org to study how to add markups to your site, or you can use plugins or modules designed to do the work for you. Plugins and modules. Schema Creator by Raven is one plugin that adds markups to WordPress sites, and Drupal has a Schema.org module. Google schema generator. You can also use Google’s Structured Data Markup Helper to generate tags for your site, and you can test existing markups using this Testing Tool from Google Developers. Tools for Bing. Although Google is by far the leader in search, Bing is gaining market share. This resource explains how Bing utilizes your site’s markups for its own search results. Before adding markups to every page of your site, try A/B testing it with two landing pages for your most popular product or search keywords. Use one landing page with markup and one without to see if markups cause users to click through to your site more often. When you develop websites for clients, try offering structured data markup as an add-on service. It’s a great way to generate some extra cash flow and requires minimal extra time. Screenshots by Jacqueline Lee (Fair Use – public domain).